Betty Ensor Thomas ..... From time to time I will have a Guest Blogger here. Sometimes it is just easier for someone else to explain things other than just shoes. So, today please let me introduce you to my friend The Shoe Psychiatrist. The Shoe Psychiatrist .. Plantar Fasciitis is one of the most common foot ailments that I deal with on a regular basis. I have listened to more people describe their symptoms that when I got it I knew exactly what it was. I can tell you from experience - it is not something that you ever want to have. Plantar Fasciitis is inflammation of the thick tissue on the bottom of the foot. This tissue is called the plantar fascia. 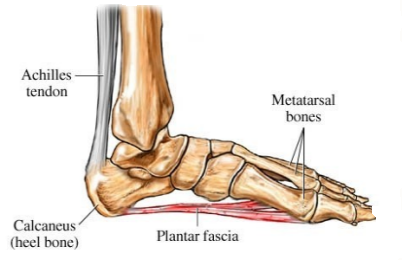 It connects the heel bone to the toes and creates the arch of the foot, and when it is inflamed it hurts. The most common complaints are PAIN and STIFFNESS in the bottom of the heel. That pain can be sharp or dull and the bottom the foot could also burn or ache. The pain is usually worse as you try to take your first steps in the morning, after sitting or standing for a length of time, when climbing stairs or after intense activity. The pain may develop slowly over time, or suddenly after intense activity. There can also be some mild foot swelling or redness. Plantar Fasciitis occurs when the thick band of tissue on the bottom of the foot is overstretched or overused. Studies also state that Shoes with poor arch support or soft soles, foot arch problems, long-distance running, sudden weight gain, and tight Achilles Tendon increase your chances of having this problem. Plantar Fasciitis is commonly thought of as being caused by a heel spur, but research has found that this is not the case. Heel Spurs are seen in people with and without Plantar Fasciitis. OH, that is a very good question andthere is a very long list of answers. I start by telling you what I do. 1... Get a good pair of shoes. Get shoes with good arch support and cushions (like SAS® Walking Shoes). exercises. I do stretch exercise before I even get out of bed (See Picture 3). Through out the day I step on the edge of a step and then lower my body up and down. 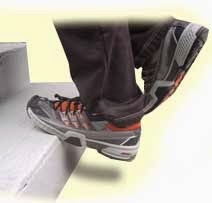 This pulls and helps loosen the Achilles Tendon and Calf Muscles (See Picture 4). This really helps me. 3... If my feet are really inflamed I might take an anti-inflammatory medication such as Tylenol, Advil or Mortrin. You might want to check with your doctor first about this. 1... Resting as much as possible for a week (who can do that?). 2... Apply ice to the painful area. Do this at least twice a day for 10-15 minutes, you may want to do it more often in the first few days. 3... Try wearing a heel cup, felt pads in the heal area or other shoe inserts. 4... Use night splints to stretch the fascia overnight and help it to heal faster. 1... Wearing a boot cast for up to 6 weeks (looks like a Ski Boot). 2... Custom Made Shoe Inserts (orthotics). 3... Steroid Shots or injections into the heel (Ouch). 4... Foot surgery may be necessary. In almost all case Non-Surgical treatments will improve the pain and help your feet heal. I have never had Plantar Fasciitis more that 3 months, but for some treatment can last from several months to several years. I have not had Plantar Fasciits for over 6 years now. Why you ask? It is because I replaced my shoes with the best supportive shoes I can find (SAS®) at the firest sign of back, knee, or foot pain, and I continue with my stretching exercises on a daily basis. 1... Your feet take you everywhere you go - take care of them. Always wear proper fitting comfortable supportive shoes. 2... If you are in or near the Nashville, Tennessee area go see my friends at Ensor's Comfort Shoes. They have been helping people with Plantar Fasciitis since 1993.